At 14ft by 7ft 2ins, the modern boats are very wide compared to other classes, giving maximum righting moment when hiking, without needing a trapeze. The earlier hull shapes were much narrower, when river sailing was a priority. We are one of the few classes to stick with clinker construction (wood or plastic), making very beautiful boats, and no - that doesn't make them heavy! Mainsail shapes are very distinctive, with a long top batten giving extra area high up. 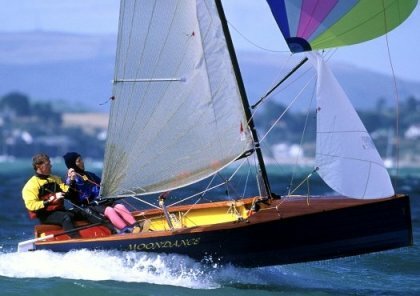 The rules allow for different sail plans but most new boats since the early 1990s have opted for what has become more or less a class 'standard'. A large symmetric spinnaker gives exciting reaches, and allows running too - an important consideration on rivers and restricted water where asymmetrics cannot operate. The top crews opt for carbon fibre to keep weight right down, but most boats have aluminium spars. Twin spinnaker poles are normally used, stowed along the boom. A few 'household' names have been heavily involved with the class, from Jack Holt who designed the first Merlin in 1946, through Beecher Moore, Spud Rowsell, Phil Morrison, Ian Proctor, Jon Turner, John Oakley and Lawrie Smith. Looking around todays fleet, you will notice many more female crews than in other classes, plus a high proportion of husband/wife and parent/child combinations. Right from the start the class was designed to encourage this equality, and it also makes for better socials too!